I began the day with a simple French breakfast, croissants with strawberry jam and coffee, outstanding! Fortified by this and a fine nights sleep I hit the road South, around Tolouse the weather began to close in, the light drizzle strengthened into a downpour. Odd new smells filled my senses, which can only be described as cats' pee, surely this can't be the smell of the Pyrenees? Perhaps my walking boots have finally achieved critical mass. The road narrowed from dual to single carriageway, cutting deeper through a gorge, where ominous black walls of rock dripped with moisture. The signs indicated that Andorra was only 25km away, but there was no sign of snow here. Had the websites lied? Should I have brought the skibikes wheels with me? Was this going to end up as a hiking trip? A road sign announced that this was the last spot to fit snow chains, then the switchbacks and hairpin bends began. The engine laboured and the cloud level descended to meet the road, visibility fell to 20m. I caught a glimpse of snow alongside the road, we climbed on and upward, the pace now set by lumbering camper vans. Abruptly the climb finished, there was a customs/passport check (Andorra is not in the EU) and further on in the gloom you could see the first chairlifts at Pas de la Casa, next the vapours cleared to reveal a surreal vista of snowfields and mountains amid the clouds. 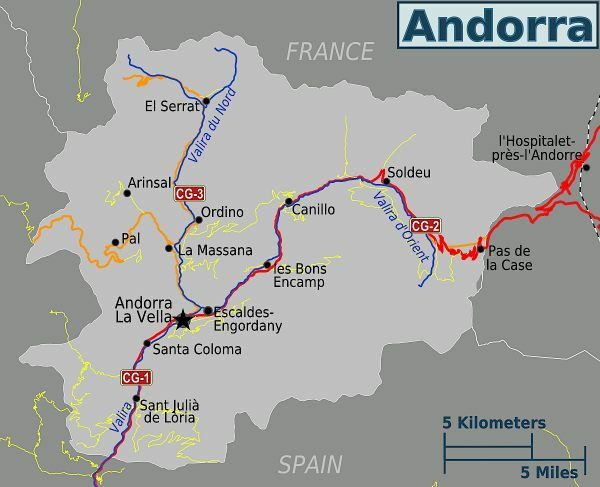 After crossing the highest road in the Pyrenees it descended slowly into the Andorran river valley floor, it connected the many small towns that I recognised from my internet research. Leaving Andorra's only main road at Escaldes the road climbed upwards once again, passing through La Massana and ending at Arinsal. The hotel L'Ayma was right next to the gondola just as described, on check in I realised that French was going to be our common language, which is just as well, because my Spanish is shameful. I sorted my kit out then went out for local orientation, first stop next door to the Pub and its welcoming staff, a quick beer to slake my thirst and found out the location of wifi hotspots, supermarket and cash points. I headed down the hill, eventually finding myself back in La Massana and picking up piste maps from the tourist office.